Vilmos Anomaly with a fist full of routing potential. Vilmos Anomaly is that nightmare that you can’t seem to get out of. Vilmos Anomaly is also that serene dream in which you’re flying around in a utopian world petting kittens and having a pizza party. That is the abstract sonic adventure that he will take you on, and trust me, there is more to it than that. 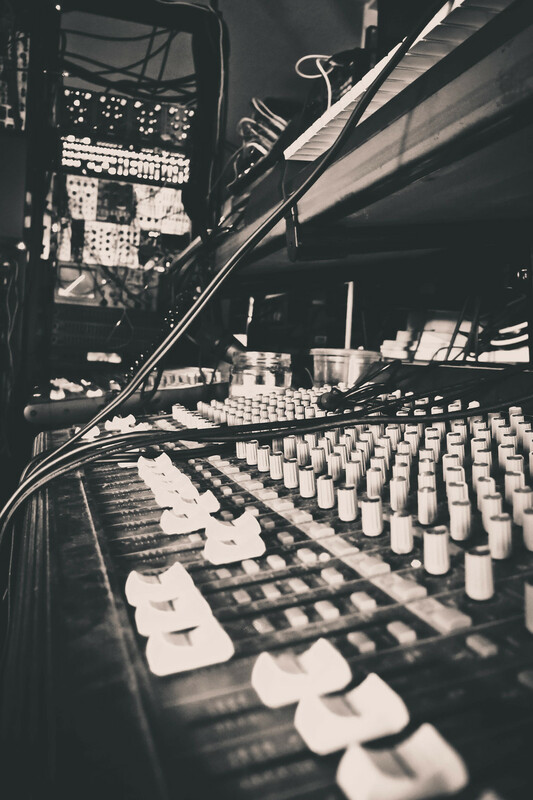 What piece of gear or software finds its way onto all your songs and why is it your favorite? The pieces of gear that have been used in all my pieces of music are of course the support systems comprising the ZOOM H6 24bit 96 kHz recorder, the Behringer and Mackie mixers, and Audacity on the Windows computer; oh, and of course the dozens and dozens of different types of music cables, can't do it without you. For modular instruments, the Moog Mother-32 and Roland System-1m are in just about every song due to their versatility and amazing sound potential, and to back them up of course the HexInverter Mutant Bassdrum with it's beats similar to the TR-808 in some ways. 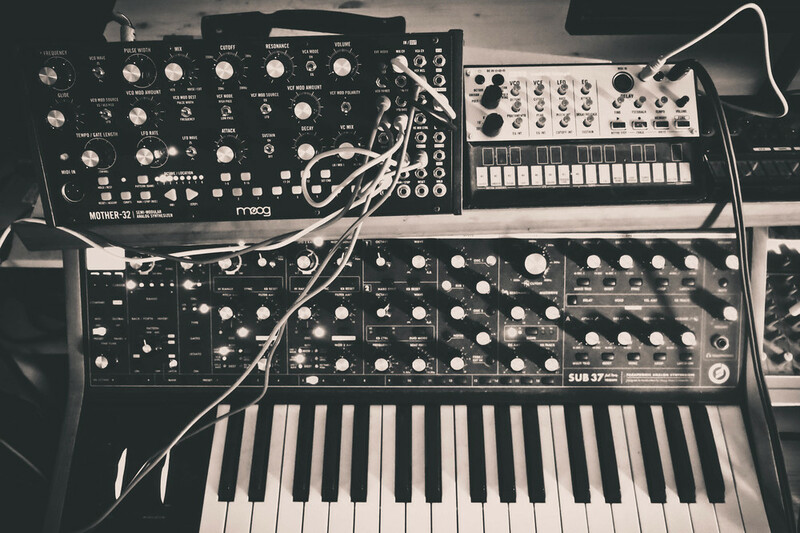 My favourite instruments are the Moog Sub 37 and the Elektron Analog Rhythm, it's going to take years to master these beauties, well, maybe master isn't the right word... I'm humbled by their awesomeness every time I play them. What emotions do you like to write from/capture in your sound? I like to transfer emotions into my music. It's strange, being in the groove for me has a lot to do with how it feels to be driving the music from emotions. The first major experience I had doing this was after the horrific Paris incident [editor: 2015], which of course was disheartening watching the news when that happened. That dark emotion was irking me and I knew I wanted to express it with dark tones. What came from that is the piece, "Requiem For Innocents Everywhere" which is a tribute to those taken from life by those who initiate aggression whereever they might be in the world. I have other pieces which are happy, cheerful, dramatic, basically I love grooving emotions into sounds and music. Most pieces I make now are all about the groove being present. Recently I've expanded into focus on drums and percussion and am working to learn all the amazing electronic instruments that are available today. How did you find your way into electronic music? I've been making electronic music in a serious way for almost two years now, having ordered my first music instrument, a Teenage Engineering OP-1, OP-12, and OP-14 in May 2015. I've always loved music but never felt I had any talents at making it, and my fellow third graders in school agreed when I took up the Kazoo! Damn, I loved that wicked instrument! About a year and a half ago I took a natural approach to losing weight and about a year in I had lost 68lbs. As a pleasant side effect, creating music turned on in a big way. I now feel the need to make music every day, and sometimes all the time. Since then I've been learning by doing, by making mistakes, by hearing, which has dramatically improved at distinguishing the sounds in music, and by attempting to learn some music theory. A little bit of which is a dangerous thing. I have a love of music from films, movies, videos and television shows. Do you have any parting remarks? Love the ones you love, time is ticking into the future. Enjoy the ride as we orbit Sol on this pale blue wet rock. Expressing and communicating feelings and emotions through music has its own rewards. Music heals, for the love of music, others liking it is a bonus. Less is more, and more is also more. The Non-Aggression Principle which is similar to the Non-Interference Directive or Prime Directive from Gene Rodenberry's Star Trek are good principles to live by, and even better principles to require of politicians and all of those in government. Creating music connects me deeper with life and provides wonder and anticipation when I press that key or turn that dial just so. I encourage everyone to find their groove whatever style it might be, whatever beat it might be, however loud or soft it might be, or whichever part of the deep dark abyss of all possible music you spelunk for us to hear. Every sound you make is a sound that exists in objective reality. Some sounds even combine into music, some music even touches and moves people. Make it so.